After: Starting from the 3rd day, my piles problem has recovered. More smooth urination and my visual also getting better. Backache problem becomes lesser, my bald area is starting to grow more hairs and my life is more perfect now. Before: Since 20 years ago, my body will become numb after sitting for long time. I am also facing bowel movement, urination and insomnia problem. After: On the 5th day, my body numb has gone. Now, I do not have problems with bowel movement, urination and insomnia anymore. Before: My body very easily tired, frequent urination at night time, foot pain and my sugar level reading recorded at 11.0 mmol / L since 7 years ago. After: Frequent urination problem has been resolved, no more foot pain and my sugar level reading has reduced to 9.3 mmol / L.
I would like to introduce everyone to take VITCA-M ™. It is absolutely a fantastic product. My face now already has brightening effects, I have slimmed down by 3kg. My overall heath has been improved tremendously and my blood spot has been eliminated after consume the product. Sinus problem happened when I was at Standard 3. My nose frequently feel itch and sometimes up to the eye. Due to nose clogging, very often I sleep with snoring in past 3 years. I always have to see doctor when facing flu problem and it forces me to rest for few days. After take 2 boxes of Vitca-M, my sinus problem has begun to cure and my all symptoms and problems have obviously improved. Since I was pregnant and delivered baby, my body presented many red spots. The problem cannot be resolved even though I have consulted many doctors and apply many type of medicines and treatments. Besides, I am also facing constipation problem which make me need to go to toilet many times a day. Fortunately, on 5th of July 2009, I was introduced by a friend to start consume VITCA-F ™. After I have drunk it for one month later, my body’s red spots have gradually disappeared and it is total gone now. Another good news to me is my constipation problem also being resolved. Before: In the past 5 years, I always felt difficulty to breathe, insomnia and bad temper especially when the outbreak of Thyroiditis. To the worst scenario, it causes my heart pain. After: Thyroiditis problem is now under controlled. The insomnia problem has been recovered and now I can breathe more smoothly. Before: My body always feels pain and my menstrual period is also irregular. My weight is 60kg and always facing insomnia problem. This problem has been with me for the past 10 years. I always take painkiller but it does not see any effect. After: My body pain has been reduced tremendously after a week and my menstrual period is getting more regular. My weight has now reduced to 55kg. I can sleep better now and my skin also becomes more shining. The few months that I have consumed VITCA-F ™ has added vitality to my daily living. I feel more energetic, certainly less stressful and have better concentration on what I want to do for the day. I also feel less lethargic and a lot more strengthen in mind and body. I am also sleeping better, and now have a good appetite than before I consume VITCA-F ™. I would recommend you try VITCA-F ™, you will feel the result, you will experience a whole new dimension to living and life. 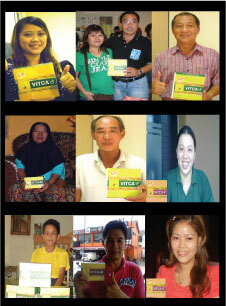 VITCA-F ™ has a good tinge of lemon taste, I enjoy taking VITCA-F ™. The drink has made me feel better in mind and body, I feel livelier and more energetic for the day’s activities. I am less tired, not so stressful these days and because of these benefits, I have a regular menstrual cycle than before. VITCA-F ™ boosts your energy and keeps you vibrant and full of vitality all day. Try it, it will make that difference for you to be thankful you consume VITCA-F ™!